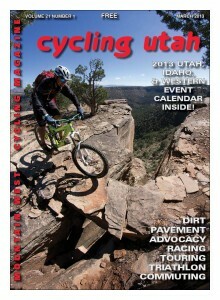 Cycling Utah’s March 2013 Issue is Now Available! Cycling Utah's March 2013 cover. Quentin Morisette from Over the Edge Sports in Hurricane, UT riding the rock bridge section of Little Creek Mesa in January, 2013. Cycling Utah Magazine's March 2013 Issue is now available as a PDF (9 mb download), Pick up a copy at your favorite Intermountain bike shop or other location!